The device, called ReWalk, is a motorized, fitted brace that supports the legs and part of the upper body. The motors supply movement at the hips, knees and ankles. The device also uses a tilt sensor and backpack with a computer and power supply. 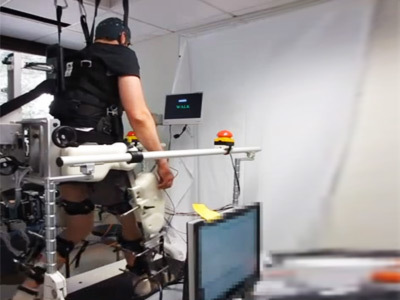 A person wearing the suit will be able to sit, stand and walk with assistance from a trained companion, according to the FDA statement. Paralysis – either complete or partial – due to a spinal injury affects approximately 200,000 people in the US, the Centers for Disease Control and Prevention says. Candidates for the ReWalk have spinal cord injuries at levels T7, the seventh thoracic vertebra, to L5, the fifth lumbar vertebra, when accompanied by a specially trained caregiver. A version is approved for use at rehabilitation institutions only for people with injuries at levels T4, the fourth thoracic vertebra, to T6, the sixth thoracic vertebra. 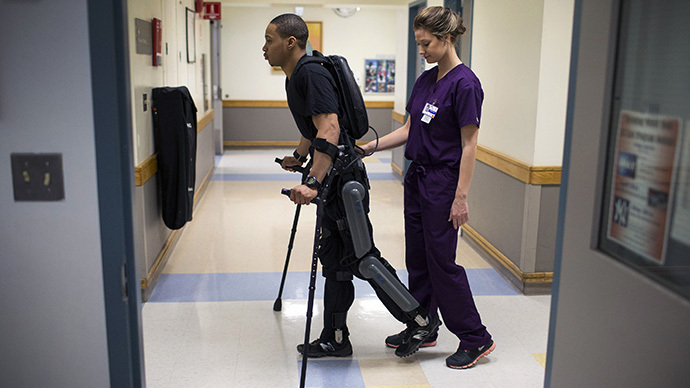 Argo Medical Technologies’ ReWalk Robotics went through “a rigorous de novo process that involved multiple clinical studies demonstrating safety and effectiveness of the technology” to be cleared for marketing, the company said in a statement. 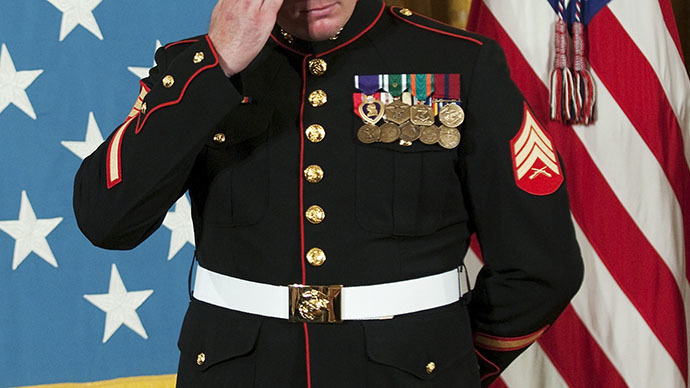 Marine Capt. Derek Herrera – who was paralyzed when he was shot in the spine while leading a team on patrol in Helmand province, Afghanistan in 2012 – will receive one of the first ReWalk devices. With help from the Marine Special Operations Command Foundation (MARSOC Foundation), he has been using the device in his office under the supervision of his physical therapist since November 2013, he said on his website. Herrera said he tried two different exoskeleton systems, the ReWalk and the Ekso by Ekso Bionics. He chose the ReWalk because it was specifically designed for personal use, he said, as well as the fact that it has already been approved in Europe (in 2012) and in Israel, where Argo Medical is located. Claire Lomas became the first woman to complete the London Marathon in a bionic suit in May 2013. It took her 16 days to run the race, but she said she was “over the moon.” The jewelry designer was left paralyzed from the chest down following a horse-riding accident in 2007. Theresa Hannigan, an Army veteran from Long Island, NY, tested the ReWalk at the Bronx Veterans Affairs Hospital. She was in Israel in March 2013, where she met with President Barack Obama and Prime Minister Benjamin Netanyahu. She asked the US president to help the device gain FDA approval. Before FDA approval, the ReWalk could only be used in a hospital. Now the exoskeleton only requires in-hospital training. The high-tech prosthetic system was first tested at Moss Rehab in Philadelphia, Pennsylvania. “This is an incredible step forward in allowing patients who normally would be unable to walk, who are dependent on wheelchairs, to now be able to use a device that will permit them walking mobility around their house and the community,” Dr. Alberto Esquenazi, the chief medical officer at Moss Rehab, told KYW-TV. The device was invented by Dr. Amit Goffer, who founded Argo Medical. Goffer was paralyzed in an accident with an all-terrain vehicle in 2001.